.. new resources for updated geographic reference and statistical mapping and geography for routing logistics and optimization .. The Census Bureau TIGER/Line is a continuously updated geographic database used for geographic reference and geospatial processing of data from various Census statistical programs including the decennial census Census 2010 and American Community Survey (ACS 2014). The public use version of TIGER is released annually that includes updates developed during the year. ProximityOne integrates the TIGER geographic updates in the Digital Map Database. Warren Glimpse, founder of ProximityOne, developed the GBF/DIME used as the prototype for TIGER/Line development. See related Web section for more details, interactive table and access to GIS resources. The TIGER database includes many types of files and data. The data are developed in the form of shapefiles and dbase files that may be used directly with the ProximityOne CV XE GIS software at no fee. Perform wide-ranging mapping and geospatial analysis applications using these GIS resources. See more aboutmapping statistical data. This section is focused mainly on the use of the TIGER/Line “edges” shapefile. The edges shapefile U.S. wall-to-wall street/road coverage in the form of line shapefiles. Lines classified as roads are intersection-to-intersection road segments. Line segment fields include name, left- and right-side high and low addresses, and many related attributes. Use the U.S. by county interactive table below to examine attributes of TIGER 2016 street/road coverage. ProximityOne developed these county summary data by processing each county edges shapefile. 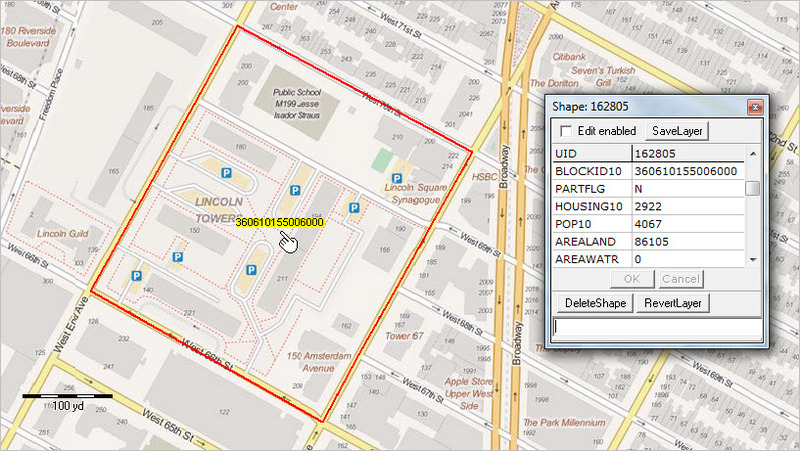 See about using the edges shapefile with the CV XE GIS software below in this section. The following sequence of graphics shows an example of a “road segment” in context of related geography. These applications focus on an area in Kansas City, MO (Jackson County),. Jackson County has 52,139 TIGER 2016 road segments. See the related step-by-step summary of how you can create these and similar map views using CV XE GIS below in this section. – Starbucks locations shown as red markers; pointer on road segment by a Starbucks location. – View illustrates how non-Census, non-statistical data can be integrated with TIGER. – Clicking on the road segment (in GIS operation), a mini-profile displays. – The profile shows attributes of the selected road segment. 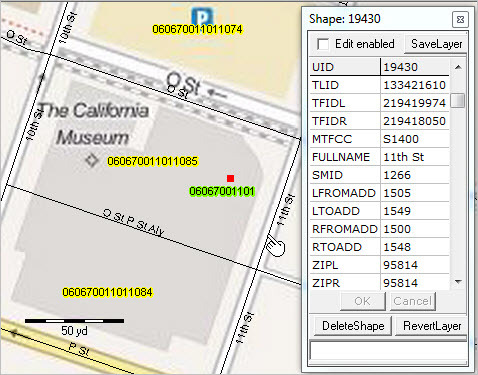 .. the TLID value shows the unique ID for this segment among all segments in U.S.
.. left- and right-side high and low address ranges and included in the profile. – The road segments are boundaries for census blocks. 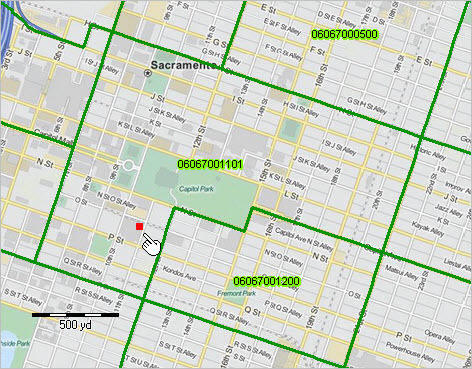 – The census block boundaries are shown using a related TIGER blocks shapefile. – The more that 11 million census blocks cover the U.S. wall-to-wall. 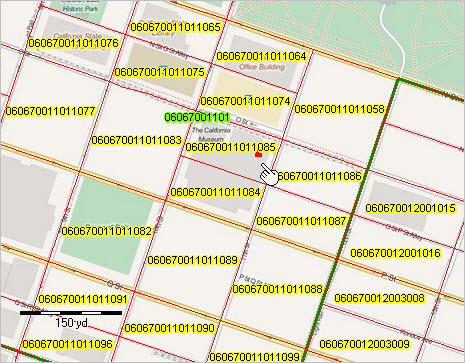 – The census block code (290950073002017) is shown as a label in the map graphic and in the profile. – A zoom-out shows the location, roads and blocks for a broader areas. – The January 2016 Kansas City city area (orange cross-hatch pattern) is shown using a related TIGER 2016 shapefile. TIGER/Line 2016 vintage files were released in August 2016. While many aspects of road coverage remain as described in this section, TIGER/line 2016 includes many updates as well as “new vintage” geography for school districts, state legislative districts, congressional districts and other political/statistical area geography. • More about TIGER 2016. • More about TIGER/Line in general. The following graphic illustrates use of the interactive table to examine the number and characteristics of road segments by county. This view shows the top 10 counties based on the number of total road segments. .. examining workers living/working in area .. population change due to commuting & employment/residence ratio .. the concept of the daytime population refers to the number of people who are present in an area during normal business hours, including workers. This is in contrast to the resident population present during the evening and nighttime hours. Information on the expansion or contraction experienced by different communities/areas between nighttime and daytime populations is important for many planning purposes, including those dealing with market size, trade/service areas, transportation, disaster, and relief operations. See related Web section with more detail. 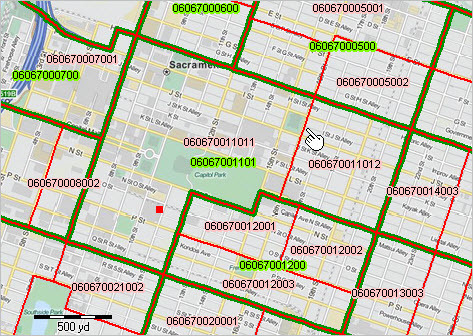 This section reviews use of analytical tools to examine daytime population and related measures by census tract using GIS resources. These data are based on the 2013 American Community Survey 5-year estimates (ACS2013). The following graphic shows patterns of the resident population by census tract for the Los Angeles area. Census tracts are statistical areas designed to average 4,000 population as reflected in this view. See population size/color intervals in inset legend. Primary roads are shown in the graphic; the pointer shows the Los Angeles-Orange County boundary. Click graphic for larger view. Expand browser window for best quality view. The larger graphic shows Los Angeles city as a cross-hatched overlay. This graphic is presented to compare/contrast patterns of the daytime population shown in the next graphic. – View created with CV XE GIS. See more about the Los Angeles metro and California state & regional data resources. The following graphic shows patterns of the daytime population by census tract for the Los Angeles area. This graphic is presented to compare/contrast patterns of the daytime population shown in the above graphic. As the employed population commutes during the data, the daytime population of census tracts change as reflected in this view. See population size/color intervals in inset legend. Primary roads are shown in the graphic; the pointer shows the Los Angeles-Orange County boundary. Click graphic for larger view. Expand browser window for best quality view. The larger graphic shows Los Angeles city as a cross-hatched overlay. The following graphic shows patterns of the Employment-Residence (E-R) Ratio by tract for the Los Angeles area. See E-R/color intervals in inset legend. See about the E-R ratio below. Primary roads are shown in the graphic; the pointer shows the Los Angeles-Orange County boundary. Click graphic for larger view. Expand browser window for best quality view. The larger graphic shows Los Angeles city as a cross-hatched overlay. The E-R ratio is a measure of the total number of workers working in the area, relative to the total number of workers living in the area. The E-R ratio is used sn indicator of the jobs-workers balance in an area. A value greater than 1.00 shows there are more workers working in the area than living there (net importers of labor). A value of less than 1.00 is shown in areas that send more workers to other areas than they receive (net exporters of labor). See related Web section for information on daytime population terms and concepts. .. tools to examine housing prices by 5-digit ZIP code and how they are changing .. of the 17,931 5-digit ZIP codes tabulated, 8,074 experienced a decrease in housing value during the period 2010 to 2015. At the same time, 8,672 ZIP code areas experienced an increase in housing value. Housing prices increased for most ZIP codes from 2014 to 2014. Find out more about housing prices and trends for ZIP codes of interest using tools described here. These data are based on experimental estimates of the Housing Price Index (HPI) by 5-digit ZIP code based in part on home sales price data from Fannie Mae- and Freddie Mac-acquired mortgages. See more about these data. • Use the interactive table to view, rank, compare the HPI for all 5-digit ZIP code areas tabulated. • Use GIS tools described here to develop thematic pattern maps; add your own data & geography, select different HPI measures or criteria; zoom to different geographic extents, label and modify colors as desired. The following graphic shows patterns of housing value appreciation by ZIP Code: 2010-15 for the Houston metro (bold brown boundary). The color patterns/intervals are shown in the inset legend. Data are not available, using the criteria applied (2000 base year), for areas not colored In the larger view (click graphic), ZIP codes are labeled with HPI percent change from 2010 to 2015. Click graphic for larger view. Expand browser to full window for best quality view. Use the GIS tools described here to develop thematic pattern maps for a range of data and criteria. The interactive table presents annual HPI data 2010 through 2015. A much larger set of these ZIP codes show a negative change between 2010 and 2015 compared to the one year change 2014-2015; The data generally show more ZIP codes experiencing housing value appreciation 2014-2015 compared to the longer period 2010 to 2015. These trends underscore the importance of having more recent data for use in analysis, planning and decision-making. The next update based on transaction data will be May 2017 or later. ProximityOne uses the HPI transaction data with other data to develop HPI current estimates (2016) and annual projections to 2021 with quarterly updates as a part of the Regional Demographic-Economic Modeling System (RDEMS). Experimental county-up (metro, state, U.S.) and sub-county estimates and projections are planned for the fall 2016 quarterly update. The model based estimates and projections include the number of units by type and value that are added to the housing stock used to compute a variation of the HPI. Use the interactive table to examine the Housing Price Index (HPI) by 5-digit ZIP code. The following graphic illustrates use of the table to show the 10 ZIP codes experiencing the largest percentage increase in the HPI from 2014 to 2015. Click graphic for larger view. Examine cities or ZIP code ranges of interest using tools below the table.